Did you understand everything? Check it with the interactive quiz on the bottom of the page. The protagonist of Hamlet is Prince Hamlet of Denmark, son of the recently deceased King Hamlet and his wife, Queen Gertrude. After the death of the King, his brother Claudius proclaims himself King and hastily marries Gertrude. The play opens on a cold winter night at Elsinore, the Danish royal castle. The guards try to persuade Horatio that they have seen King Hamlet's ghost, when it appears again. After hearing from Horatio of the Ghost's appearance, Hamlet resolves to see the Ghost himself. That night, the Ghost appears again. 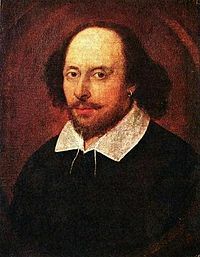 He tells Hamlet that he is the spirit of his father and that Claudius murdered King Hamlet by pouring poison in his ear. The Ghost demands that Hamlet avenge him; Hamlet agrees and decides to fake madness to avert suspicion. He is, however, uncertain of the Ghost's reliability. Busy with affairs of state, Claudius and Gertrude try to avert an invasion by Prince Fortinbras of Norway. Perturbed by Hamlet's continuing deep mourning for his father and his increasingly erratic behaviour, they send two courtiers—Rosencrantz and Guildenstern—to discover the cause of Hamlet's changed behaviour. Hamlet greets his friends warmly but quickly realizes that they have been sent to spy on him. Werk von Shakespeare Hamlet remains unconvinced that the Ghost has told him the truth, but the arrival of a troupe of actors at Elsinore presents him with a solution. He will stage a play, re-enacting his father's murder, and determine Claudius's guilt or innocence by studying his reaction. The court assembles to watch the play; Hamlet provides an agitated running commentary throughout. When the murder scene is presented, Claudius abruptly rises and leaves the room, which Hamlet sees as proof of his uncle's guilt. Claudius, fearing for his life, banishes Hamlet to England on a pretext, closely watched by Rosencrantz and Guildenstern. Alone, Claudius discloses to the audience that he is sending Hamlet to his death. Gertrude summons Hamlet to her closet to demand an explanation. On his way, Hamlet passes Claudius in prayer but hesitates to kill him, reasoning that death in prayer would send him to heaven. In the bedchamber, an argument erupts between Hamlet and Gertrude. 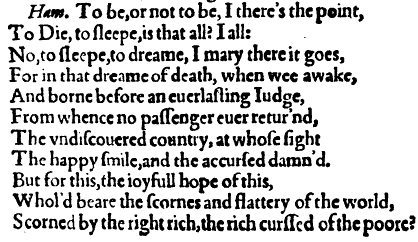 Polonius, who is spying on the whole scene behind an arras, panics when it seems as if Hamlet is about to murder the Queen and cries out for help. Hamlet, believing it is Claudius hiding behind the arras, stabs wildly, killing Polonius. When he realizes that he has killed Ophelia's father, he is not remorseful, but calls Polonius "Thou wretched, rash, intruding fool". The Ghost appears, urging Hamlet to treat Gertrude gently but reminding him to kill Claudius. Unable to see or hear the Ghost herself, Gertrude takes Hamlet's conversation with it as further evidence of madness. Prior to embarking for England, Hamlet hides Polonius's body, ultimately revealing its location to the King and Gertrude. We next see two gravediggers discussing while digging her grave, that Ophelia died from apparent suicide. Hamlet arrives with Horatio and banters with a gravedigger, who unearths the skull of a jester from Hamlet's childhood, Yorick. Ophelia's funeral procession approaches, led by Laertes; he leaps into the grave, cursing Hamlet as the cause of her death. Hamlet professes his own love and grief for Ophelia, and he and Laertes grapple, but the brawl is broken up. Diese Seite wurde zuletzt am 29. November 2018 um 04:19 Uhr bearbeitet.